Dimension Furniture was founded by cabinet maker Martin Parsons to produce bespoke handmade furniture of the highest quality. As a cabinet maker, Martin works primarily with wood, though other materials, such as metal and glass, may be used where appropriate. In particular, Martin likes to use native UK hardwoods from sustainably managed woodlands, such as Oak, Ash and Cherry. 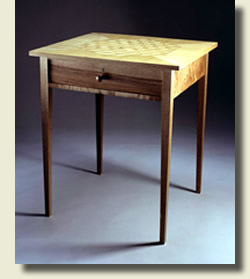 Martin trained as a furniture designer and cabinet maker at Rycotewood College, near Oxford, one of the country's leading furniture craft and design centres. After gaining a sound foundation at Rycotewood College, Martin then spent a year with Bruce Luckhurst at the Little Surrenden Workshops near Ashford, Kent, further refining his skills as a cabinet maker, and gaining a City and Guilds Distinction in Advanced Crafts in Furniture. He is now based in Oxted, Surrey. Dimension Furniture recently moved workshops to premises in Hartfield, in East Sussex, so are well placed for customers in Surrey, Kent, East Sussex and South London. Enquiries are welcomed from other UK cabinet makers regarding sub-contract work or creative collaboration.